Jonathan Papelbon thought the turning point was the bottom of the eighth, while "Sweet Caroline" was playing and news of the Bruins' win over Montreal was flashed on the board. "You could just sense that Boston fever from the crowd," said Papelbon. "City of Champions. Right there, something special happened." Maybe it was that the Red Sox got some adrenaline at that moment. Papelbon, who saved the 5-3 win over Texas last night, said he felt it when he came on in the ninth. The important thing is that Dustin Pedroia, David Ortiz, and Manny Ramírez felt it in the bottom of the eighth, when Ramírez sent a shot off Joaquin Benoit over the Monster, over the Boston skyline, his sixth homer of the season. The two- run blast, which scored Ortiz ahead of him, was the 496th of Ramirez's career, and the crowd of 37,598 record - a post-World War II record for Fenway - went crazy again. As the late Ned Martin would have uttered, "Mercy!" It capped a night on which the most elite 3-4 punch in the game - Ortiz and Ramírez - were clicking at the same time. When that happens, there's no hope for the Joaquin Benoits of the world. With the Sox trailing, 3-2, in the eighth, Ortiz - frustrated so long by the shifts teams impose on him - busted the shift with a scorching ball that Ian Kinsler couldn't handle in short right-center, and it scored Pedroia to tie it. 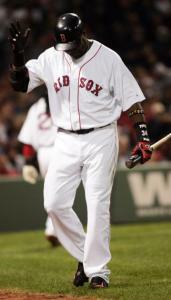 "He's gonna come through," Ramírez told Sox broadcasters Joe Castiglione and Dave O'Brien about Ortiz. "If he doesn't hit, I'll hit for him." The rally was made possible by Pedroia's one-out double off the Wall. Ortiz, who was hitting .111 (7 for 63) before busting out Friday night with a third-inning grand slam, appears to be making his way back to Big Papi status. With first base open, Texas manager Ron Washington pitched to him, not wanting to see Ramírez with two base runners. "All of Manny's swings look like some of the best swings I've ever seen," said Pedroia. "Every at-bat is a quality at-bat." Pedroia's shot to the Wall was hit into the wind. "I didn't know if I hit it well enough to get it over with the wind blowing in, but I thought I made the Wall," he said. This was Jon Lester's second-longest outing in five starts and a great improvement over his last start, in which he went 4 1/3 innings, allowing four runs and five walks against Cleveland April 14 (a 6-4 Boston win), and the one April 9, when he lasted 5 1/3 and gave up four runs and four walks in a 7-2 loss to Detroit. OK, John Farrell and Terry Francona could have done without the 10 hits the Rangers pounded, but at least Lester reduced his walk total to two after walking 15 in his first four starts. Until the eighth, the Sox' offense couldn't solve Texas starter Jason Jennings, who allowed two first-inning runs, then zeroes the rest of the way until his departure after six innings. The hardest pitch Lester threw - a 93-mile-per-hour fastball - fell into the Monster seats off the bat of Josh Hamilton with two outs in the first inning. Lester allowed three more hits in the second inning for a run. In the third inning, he allowed three straight hits - singles to Hamilton and Hank Blalock and a run-producing double to Jason Botts - giving the Rangers a 3-2 lead. After Farrell came out to the mound to reinforce the young lefthander's confidence, Lester struck out Murphy and Gerald Laird to wiggle out of further harm. "Tonight he gave up a lot of hits, but I think he only had two walks and he maneuvered his way through the lineup," Francona said. "When he first came up, we saw him do that. He'd get himself into trouble, and he'd compete, and find a way to get out." The Red Sox had taken a 2-0 lead in the first off Jennings, who was 0-3 with an 8.79 ERA in his previous three starts. Ortiz knocked into a 4-6-3 double play, but it scored leadoff man Jacoby Ellsbury, and later Kevin Youkilis doubled in Ramírez. Lester's last batter in the seventh, Hank Blalock, singled to center on the lefthander's 107th pitch, which brought on Manny Delcarmen, who made things interesting by walking Murphy before striking out Laird on a 95-m.p.h. fastball on a 3-and-2 count. Mike Timlin put a couple of batters on in the top of the eighth, but he got Michael Young to foul out to Youkilis before Javier Lopez retired Hamilton on a hard liner to center field. But no worries. The best 3-4 combo in baseball was clicking.